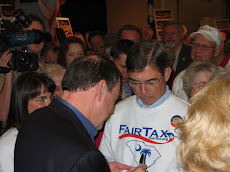 Thanks to a subscriber to ReturnToExcellence.net for sending this link of a message from Tea Party Patriots letting us know that Washington insiders, working through the Claremont Institute, are already planning to co-opt the newly elected Congressmen. In summary, based on information supplied by Tea Party Patriots, the Claremont Institute is deliberately holding a meeting the exact same day & time as the Orientation Meeting previously planned by Tea Party Patriots that will include Jim DeMint & Tom Coburn - the very people we want new Members to caucus with. 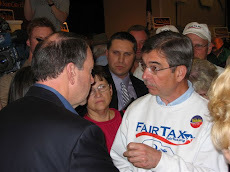 Congressman-elect Rob Woodall, during a FairTax conference call Thursday night, confirmed to me that he was aware of the conflict in dates & will attend the Tea Party meeting. The link above asks you to contact the new Congressmen listed - about 60 in total - & request that they attend the Tea Party Patriots event. I reviewed the list & recommend that you concentrate on the following two unless you have a new Congressman in your district or know another one better than the two I suggest. Both have been featured in previous postings on this blog. The Claremont Institute has some decent credentials that we should reconfirm because of the seemingly uncooperative way described above. We should @ least expect them to explain why they would not work with Tea Party Patriots in coordinating this very important event for our new representatives. You really should check your facts before you repeat the rants of others. Everything in the Tea Party Patriot op-ed by Jenny Hill Martin is false to the point of being delusional. Claremont is not putting on an event, Claremont was invited to an event initiated by the INCOMING FRESHMEN CONGRESSMEN. And yesterday John Shadegg sent out an email to the freshmen that stated "Please be advised that the Constitutional Congress is not associated with the Tea Party Patriots or any other tea party organization" and that "the organizations and events are completely separate and independent." Whatever event the Tea Party Patriots host, rest assured, De Mint, Coburn, Shadegg and the rest of the The Constitutional Congress Team’s will not be present.